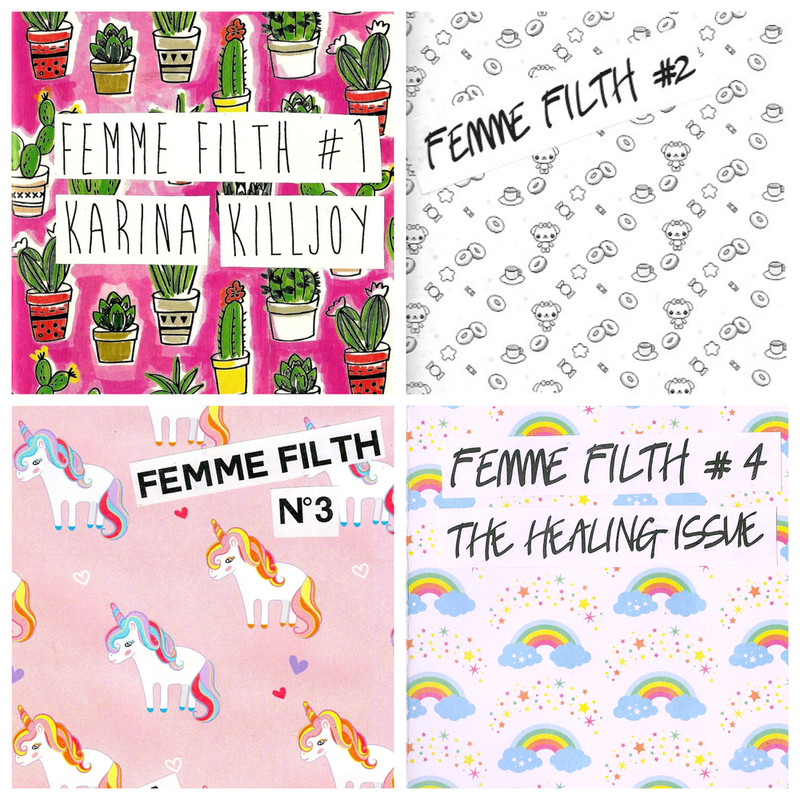 A DIGITAL bundle of issues #1-4 of FEMME FILTH, a queer femme zine about healing, mental health, and radical vulnerability, at a discounted price! Get yours here. Femme Filth #1 is a 18-page, full-color, zine about radical vulnerability, living with borderline personality disorder & ptsd, celebrating queer femmes, healing, survival, recovery, resilience, and mental health. Femme Filth #2 is a 28-page black-and-white zine about radical vulnerability, femme magic, and healing justice from the perspective of a perspective of a sick & disabled, queer femme, survivor. This zine addresses topics like protecting one's magic and energy; interdependence and community care; tangible, concrete ways to support femmes; art, idols, and idolization as a form of dehumanization; and the challenges and complexities of healing from sexual violence. Femme Filth #3 is a 20-page, full-color, digital zine about radical vulnerability, healing, and recovery. This zine explores how the author continues to nurture their healing process as they imagine futures for themselves, set intentions for 2018 and beyond, create affirmations for survivors, recommend readings and resources, and explore the joys of snail mail & penpalling. Femme Filth #4: the healing issue is a 20-page, full-color, digital zine about radical vulnerability, femme magic, healing, mental health, and survivor solidarity from the perspective of a perspective of a sick & disabled, queer femme, survivor. This zine covers the politics of survivorship; thoughts on healing & vulnerability; guides on creating affirmation lists; helpful apps for survivors; things that have helped me heal; tips on supporting survivors in tangible & concrete ways; rants, musings, & scraps from my diary; and so much more! Trigger warnings and content warnings ARE provided. Karina Killjoy is a sick & disabled high femme artist, archivist, & community organizer based in upstate New York. Their (art)work is centered around themes of radical vulnerability, healing justice, survivor solidarity, & queer femme magic. They are passionate about fatshion, critical theory, makeup, cats, & witchcraft. PS: We’re offering B&W print bundles as well at a discounted price, as well as FEMINIST AND QUEER BUTTONS! Get yours here.